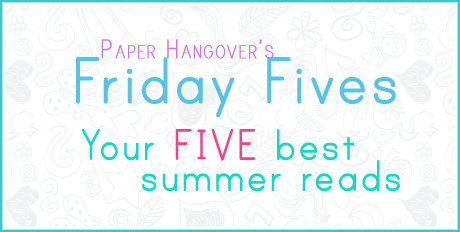 Friday Fives: What Are Your Five Best Summer Reads? PaperHangover's Friday Fives blog topic for this week? My list is comprised of all YA (but of course!) and is a combo of a few I've read (some of them, over and over and over again! ), as well as a few I plan on reading soon. What are yours? Ohhhh, I hope to find some new good books! My vote for best read in 2011 (so far!) - read it in 2 days and I'm currently reading it again right now! LOVE me some Four! :D See my review for more details. 2. THE FOREST OF HANDS AND TEETH, THE DEAD-TOSSED WAVES, and THE DARK AND HOLLOW PLACES by Carrie Ryan. Okay, so I know there are 3 titles here - but they're all a part of the same trilogy, so in my mind, they count as one! I absolutely LOVED this series. See my review here and here for more info. - not sure why, but never got to my review on THE DEAD-TOSSED WAVES. Haven't read this one, but definitely looking forward to it! Haven't read either of these, but again, looking forward to them both. Now here's a diamond in the rough I've read more times than I care to admit. Someday I'll have a cover to add below...yanno, when it's on the NYT Best Seller list! Older PostYA Critique Group Anyone?